THE Boston Celtics were able to beat the Oklahoma City Thunder in the TD Garden. Celtics snapped the Thunder's 7 game win streak with a score of 134-129. 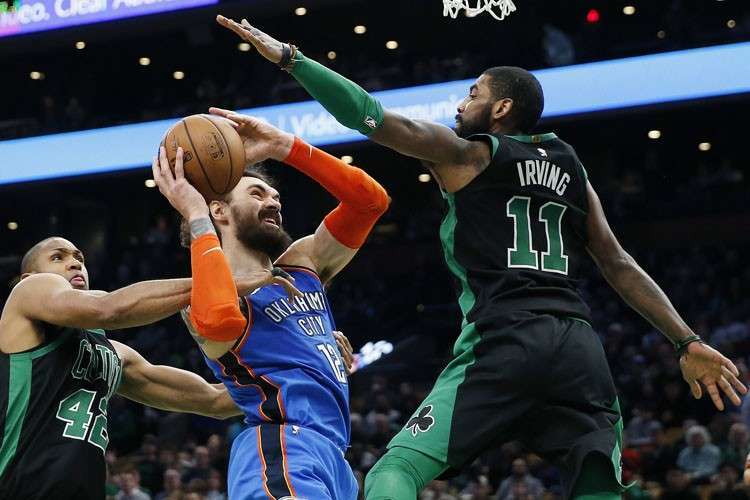 Since their loss to Golden State at their home court and nine of its last 10 games, the Celtics were winning four straight games and the Thunder was one of their latest victims. The Celtics were on fire during this game, shooting a clip of 59.3 percent on the field. Celtics relied on their all star guard Kyrie Irving who showed his talent of being clutch in the last 12 minutes of the game. Irving posted 30 points and 11 assists, with a shooting percentage of 14-19 from the field. Seven other Celtic players were able to score double digits in this game. The Thunder was led by forward Paul George's performance of 37 points while guard Russell Westbrook got a triple double of 22 points, 16 assists, and 12 rebounds. Five other Thunder players got double digit scores in the game. Still, the Thunder crumbled to the Celtics in final moments in the game. During the first quarter, the game was tight with the score of 31-29, in favor of the Celtics. When the second quarter came, the game was still near as the score was 66-58 at halftime. The same was said at the 3rd quarter when both teams would trade baskets and the matchup became much more competitive as the clock was ticking towards the last 12 minutes. It was in the fourth quarter that things got real clutch. Celtic guard Irving started to take over as he helped Boston score six of its total points straight in the last 5 minutes of the game. The Thunder were trying to pull close to the Celtics after a Paul George clutch three and smart plays provided by Westbrook. However, Irving got to work and finished clutch plays to give the Celtics the needed lead to send the Thunder home.